Have you discovered Flipster yet? Use Flipster to access the library's digital magazine collection from anywhere. Students enjoying milkshakes in the library to celebrate HM's Shakespeare Week. Author Mark Mathabane with students and teachers at HM's 25th annual Book Day, which featured Trevor Noah's Born a Crime. Students ran and participated in close to 50 workshops throughout Book Day. Book Day closing assembly featured a performance from the "Hip Hop, Ya Don't Stop" workshop. The library has lots of great spaces in which to hang out or get some work done. MD Newbery Committee members busy reading one of this year's finalists. The primary mission of the Horace Mann Libraries is to teach our students how to become independent thinkers and life-long learners who possess a love of literature; to support independent library use and research skills; and to inculcate a spirit of independent learning and a self-confidence that will serve students beyond their years at Horace Mann. Familiarity with library resources allows students to access and process information both inside and outside the library and to acquire the information literacy skills needed in our ever-changing world. In all divisions, the library is a space where human connections are nurtured and valued, even as technology plays an increasing role in research and presentation. The Nursery Division conducts classes in its new library. Students have access to the entire collection in this space and collections in classroom libraries. Classes visit the library once a week and are encouraged to use its resources at other times. The space includes a stage for dramatic play, a reading pit, a data projector with screen, and other resources. Recent physical renovations have enhanced the contribution of the Lower Division Library to the community. The addition of five computer workstations allows for a fuller integration of technology into the kindergarten through fifth grade curriculum, including access to the online catalog, Internet, Accelerated Reading Program, and other online resources. Librarians work with both fixed and flexible schedules. Weekly scheduled classes work within the established library curriculum. That curriculum can include teaching the parts of a book, using an assortment of reference books and doing online research. Flexibility in the schedule allows librarians to work closely with faculty to develop special projects and encourage individual use of the library during the school day. Katz Library faculty members serve Middle and Upper Division students in a facility completed in 2002. The librarians teach research skills using both print and online resources related to specific departmental assignments; lead the Middle Division Readers’ Forum; facilitate the Upper Division Lit-Chats, Lit-Chat sleepovers, and author and poet visits; staff the Middle Division Traveling Library, and provide recommendations and space for independent reading. Working with teachers, the librarians introduce research skills beginning in the sixth grade in history and science classes and continuing, in all disciplines, through senior year. 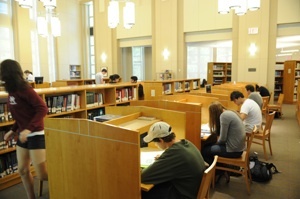 The Katz Library carries textbooks for each course for in-library use. Librarians also work closely with the Technology Department to implement new technology and alert faculty to its availability. The Library also has a self-contained electronic classroom with twenty-one laptop computers, an alumni/ae collection of books by Horace Mann graduates, and a robust graphic novel and audio book collection. Librarians assist in the development of the curriculum in a variety of ways. For example, sixth grade history students come in three times a year to learn basic research skills for print material, including finding books using the online catalog, using an index, and skimming sources for relevant information. Students then learn to use the online databases, conceptualize the best search terms, create bibliographic citations, and to avoid plagiarism by paraphrasing. This research unit is based on the curriculum beginning with African Empires, Native Americans, Roman history and early American history. Library faculty members also instruct students on how to determine which websites have authority, can be trusted, and have valuable information. Upper School biology teachers have their students do a research project on Genetically Modified Organisms. Librarians teach the students to use both our print resources and the science databases. The ninth grade history students create Joint Stock companies using the extensive print resources collected specifically for that project. The weather is getting nice . . .
Time to take a book outside and read.